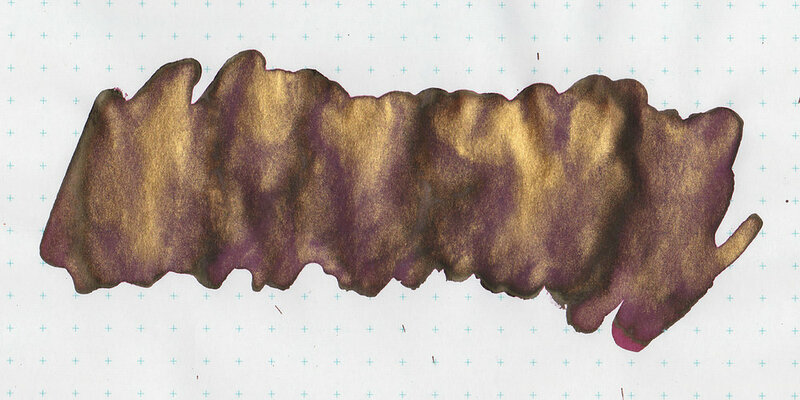 Today's ink is another one from the 2017 Diamine Shimmertastic collection-Wine Divine. I purchased my sample of ink from Vanness Pens. Wine Divine is pretty much the color of red wine with gold shimmer, so the name is appropriate. If you look closely, you can see some green sheen on the edges. 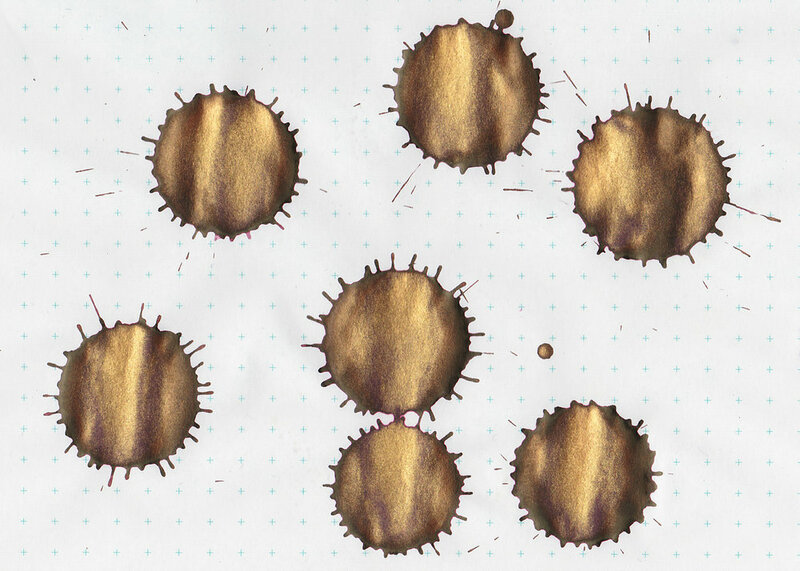 There is a lot of shimmer in this ink-wow. 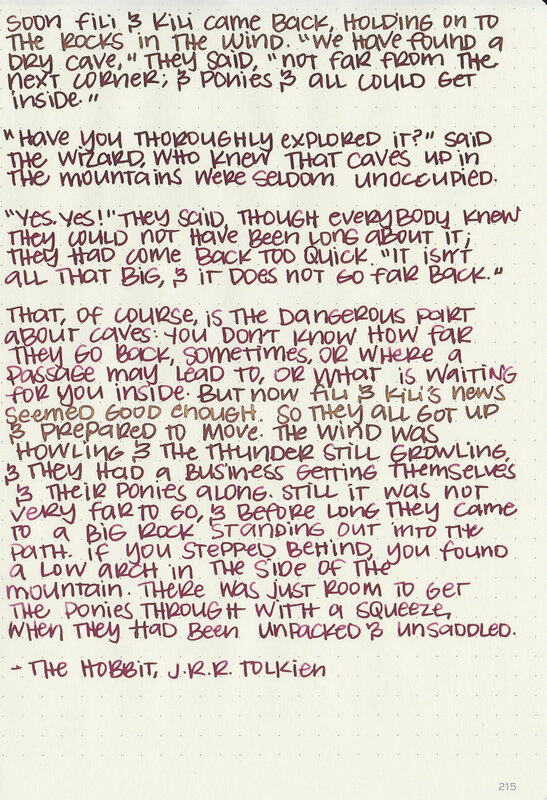 So let's take a look at how the ink behaves on fountain pen friendly paper: Rhodia, Tomoe River and Leuchtturm. Other properties: Medium shading, low green sheen, gold shimmer. The green sheen reminds me of the sheen on J. Herbin Caroube de Chypre. On 20 pound copy paper there is a little bit of feathering, but other than that the ink behaved well. 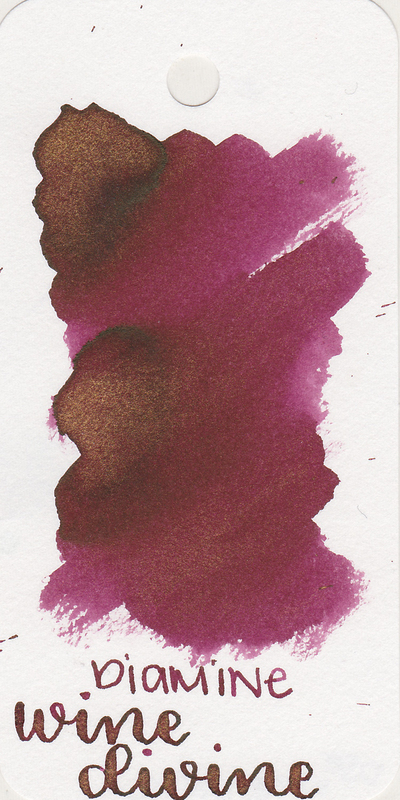 Ink swabs for comparison, left to right (top to bottom for mobile RSS): Robert Oster Australian Shiraz, Diamine Wine Divine, and Montblanc Antoine de Saint-exupery. Click here to see the Diamine inks together. I think Wine Divine is pretty close to Antoine de Saint-exupery, just with shimmer added of course. Diamine Burgundy Royale, Sailor Jentle Oku-yama, and Robert Oster Maroon 1789. Click here to see the red inks together. 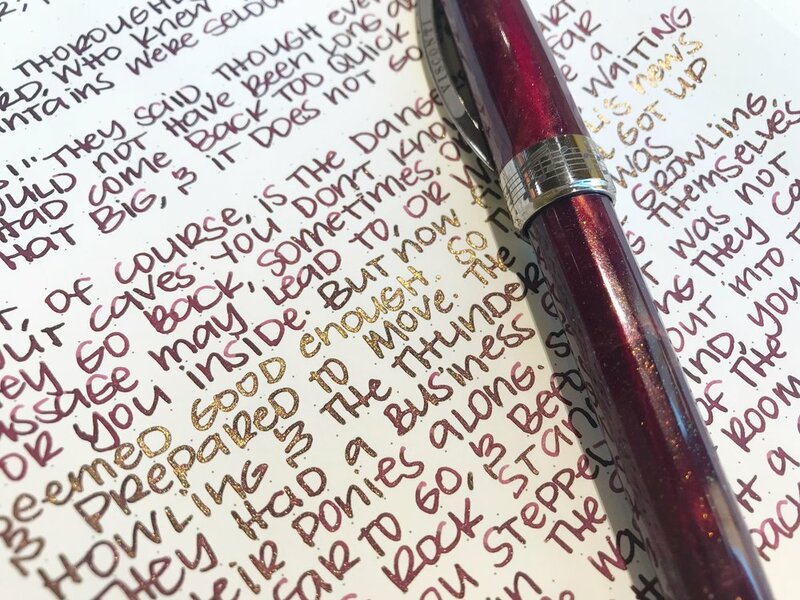 I used a Visconti Hall of Music Burgundy Jazz with a fine nib on Leuchtturm paper. I didn't have any flow issues-the ink felt average in flow, maybe just a little bit on the wet side. I think it matches the Visconti Jazz pen well. Overall, I think the ink is well behaved, has a nice color, and it looks good with the gold shimmer. It's not one of my favorite Shimmertastics, but it's still a nice one.